As stated by me elsewhere on the forum, when RNAD Lodge hill closed, they had a small museum in Upnor castle, among the artefacts held there was, I think, a Brennan torpedo plus the shell of a Whitehead weapon. Both marked for disposal, anyone know their eventual fate? A replica Brennan Torpedo exists in Hongkong, one of the locations where they were deployed. I receive 'MAASMOND' a daily maritime newsletter which although Dutch-based has worldwide coverage. The editor is currently in Hongkong & posted this item yesterday which may be of interest to KHF members & is reproduced with permission. The Brennan Torpedo station at Lei Yue Mun was built between 1892 and 1894. It was hewn out of the rock of the headland. It was the last to be constructed either in Britain or her overseas possessions. The casemates inside the Redoubt were converted into exhibition galleries for permanent displays on the history of Hong Kong's Coastal Defence covering the Ming and Qing period, the British period, the Japanese invasion and the period after the resumption of Chinese sovereignty over Hong Kong occupation. The Hong Kong Museum of Coastal Defence is only museum in the world which is having a “worked open” replica of the Brennan Torpedo on display. The Brennan torpedo was a torpedo patented by Irish-born Australian inventor Louis Brennan in 1877. It was powered by two contra-rotating propellors that were spun by rapidly pulling out wires from drums wound inside the torpedo. Differential speed on the wires connected to the shore station allowed the torpedo to be guided to its target, up to 2,000 yards (1,800 m) away, at speeds of up to 27 knots (31 mph). The Brennan torpedo is often claimed as the world's first guided missile, but guided torpedoes invented by John Ericsson, John Louis Lay, and Victor von Scheliha all predate it; however, Brennan's torpedo was much simpler in its concept and worked over an acceptable range at a satisfactory speed so it might be more accurate to call it "the world's first practical guided missile". The Brennan torpedo was similar in appearance to more modern ones, apart from being having a flattened oval cross-section instead of a circular one. It was designed to run at a consistent depth of 12 feet (3.7 m), and was fitted with an indicator mast that just broke the surface of the water; at night the mast had a small light fitted which was only visible from the rear. Two steel drums were mounted one behind the other inside the torpedo, each carrying several thousands yards of high-tensile steel wire. The drums were connected via a differential gear to twin contra-rotating propellers. If one drum was rotated faster than the other, then the rudder was activated. The other ends of the wires were connected to steam-powered winding engines, which were arranged so that speeds could be varied within fine limits, giving sensitive steering control for the torpedo. The torpedo attained a speed of 20 knots (23 mph) using a wire .04 inches (1.0 mm) in diameter but later this was changed to .07 inches (1.8 mm) to increase the speed to 27 knots (31 mph). The torpedo was fitted with elevators controlled by a depth-keeping mechanism, and the fore and aft rudders operated by the differential between the drums. In operation, the torpedo's operator would be positioned on a 40 feet (12 m) high telescopic steel tower, which could be extended hydraulically. He was provided with a special pair of binoculars on which were mounted controls which could be used to electrically control the relative speeds of the twin winding engines. In this way he was able to follow the track of the torpedo and steer it with a great degree of accuracy. In tests carried out by the Admiralty the operator was able to hit a floating object at 2,000 yards (1,800 m) and was able to turn the torpedo through 180 degrees to hit a target from the off side. According to Brennan's biographer, Norman Tomlinson, Brennan was inspired to create his torpedo's unique propulsion system in 1874, when he noticed that a cotton reel, if the thread is pulled toward the operator from underneath, moves forward rather than backward. He also realized that the only device which needed propulsion for a limited distance and which did not have to make a return journey, was a torpedo. Brennan began making rough sketches of such a torpedo, and as the concept developed he sought the mathematical assistance of William Charles Kernot, a lecturer at Melbourne University. After earlier experiments with a single propeller, by 1878 Brennan had produced a working version about 15 feet (4.6 m) long, made from iron boiler plate, with twin contra-rotating propellers. Tests carried out in the Graving Dock at Williamstown, Victoria were successful, with steering proving to be reasonably controllable, although depth-keeping was not. The British Admiralty had meanwhile instructed Rear Admiral J. Wilson, the Commodore of the Royal Navy's Australian Squadron, to investigate the weapon and report back. Alexander Kennedy Smith was also working to obtain the Victoria government's backing for the project and raised the subject in the state's legislature on 2 October 1877. A grant was eventually awarded for the development of the torpedo, and in March 1879 it was successfully tested in Hobsons Bay, Melbourne. Brennan had by now established the Brennan Torpedo Company, and had assigned half of the rights on his patent to civil engineer John Ridley Temperley, in exchange for much-needed funds. Brennan and Temperley soon afterwards travelled to Britain, where the Admiralty examined the torpedo and found it unsuitable for shipboard use. However, the War Office proved more amenable, and in early August 1881 a special Royal Engineer committee was instructed to inspect the torpedo at Chatham and report back directly to the Secretary of State for War, Hugh Childers. The report strongly recommended that an improved model be built at government expense. At the time the Royal Engineers - part of the Army - were responsible for Britain's shore defenses, while the Royal Navy were responsible for its seaward protection. In 1883 an agreement was reached between the Brennan Torpedo Company and the government. The newly appointed Inspector-General of Fortifications in England, Sir Andrew Clarke, appreciated the value of the torpedo and in spring 1883 an experimental station was established at Garrison Point Fort, Sheerness on the River Medway and a workshop for Brennan was set up at the Chatham Barracks, the home of the Royal Engineers. Between 1883 and 1885 the Royal Engineers held trials and in 1886 the torpedo was recommended for adoption as a harbour defence torpedo. In 1884 Brennan received a letter from the War Office stating that they had decided to adopt his torpedo for harbour defence and he was invited to attend a meeting to decide the value of his invention. Brennan decided to accept £40,000 as a quick answer to his financial worries but his business partner J.R. Temperley assumed control of the negotiations and demanded £100,000. The War Office agreed to this, but said that it would have to be paid out over a period of three years. Brennan accepted this, but Temperley demanded a further £10,000 for the delay, and after some argument the War Office agreed, also agreeing to pay Brennan a sizable salary to act as production chief. A scandal eventually blew up over this sum, which was wildly extravagant in comparison to the £15,000 paid for manufacturing rights to the Whitehead torpedo only 15 years previous. The Brennan torpedo became a standard harbour defence throughout the British Empire and was in use for more than fifteen years. Ricasoli & Tigne in Malta In 1905 the Committee on Armaments of Home Ports issued a report in which they recommended the removal of all Brennan torpedoes from fixed defences due to their comparatively short range and the difficulty of launching them at night. Manufacture of the Brennan torpedo finished in 1906. The only remaining original Brennan Torpedo is exhibited at the Royal Engineers Museum in Chatham, Kent. However, traces of the installation at Fort Camden in County Cork are visible to this day. And as mentioned above also at Lei Yue Mun Fort in Hong Kong on display is a replica Brennan Torpedo with the side cut away so the workings are visible. 37. The boilers, engines, and auxiliary machinery in an installation, though not part of the special gear, are intimately connected therewith, and their complete efficiency is as essential as that of the torpedo gear itself, and requires equal attention. Any alteration to machinery, & c., is likely to have some bearing, often not foreseen, on the special points connected with torpedo installations. Although, therefore, the ordinary machinery is dealt with differently from the special gear, no material alterations should be made, without reference through the proper channels, to ensure the question being considered from the special point of view. 38. Paragraph 37 above applies to slipways and installation buildings. In the case of slipways, when renewal is necessary, the curves or angle originally designed should be implicitly adhered to, unless an alteration is authorized. The necessity for extreme care in the laying of slipway rails cannot be too greatly emphasized. Accuracy in the curves, gauges, joints, & c., is essential, and any departure from this is likely to have serious results on the launching or torpedoes, and to cause actual damage. Record drawings should be made of any alteration carried out to installation premises, slipways, & c., or new work. In the case of slipways, especially, it is essential that these should show, with extreme accuracy, the curvature, & c., of the slipway as it is actually completed. 39. Attention should be given to the efficient water supply of the installation, both for boiler and condensing purposes. 40. Where installations are lit be electric light, there should always be a sufficient supply of oil lamps kept ready for use in case of emergency, with the necessary means for fixing or suspending them where required. 41. There will be, in connection with each installation, one or more Service Directing stations depending on local circumstances, which vary widely. Field of view (including the early view of approaching vessels); freedom from smoke of guns & c.; command; protection from fire; early view of torpedo; proximity to installation; communication with installation, observers, and superior authority. 43. Local considerations will probably limit the choice of sites and necessitate a compromise. The good field of view is essential, and fair proximity to the installation is advantageous, both for supervision and on account of the greater ease of steering when near the lead-in of the wires, except when the command is great. 44. Although practice considerations should not be allowed to interfere with the selection of service directing stations, and although practice should, as a rule, be carried out from these, it may be advisable to have a junction-box in some other position for certain practice purposes. A practice junction-box above, or nearly above, the inner end of the slipway, for instance, is often useful for observing the launch and the behaviour of the torpedo. 45. 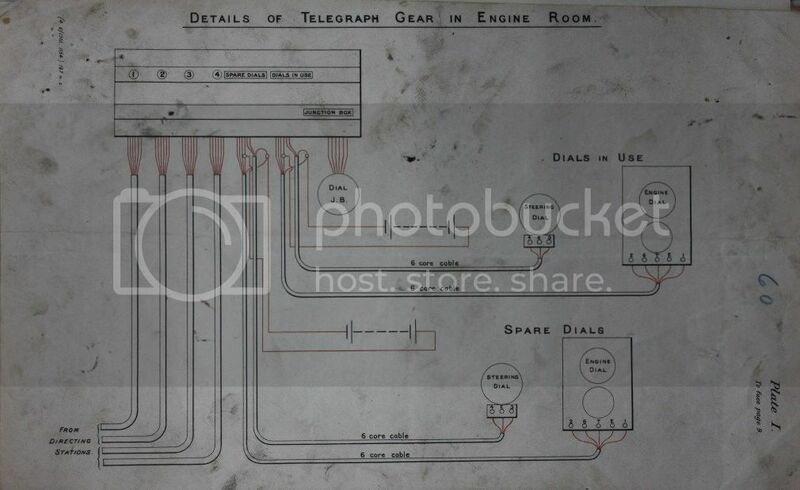 The details of the “telegraph” gear will vary to suit local conditions. The commutator provides for the use of four main cables, these may be used in connection with four separate observing stations, or it may be desirable in the case of an exposed position to duplicate the main cable from a directing station. In any case the cables should be so laid as to ensure, as far as possible, safety from damage of all kinds, especially from shell fire, ad should be so well separated so as to minimise the probability of damage to more than one at the same time. 21. It is advisable that a proportion, at least, of torpedoes in Class (II.) should be kept “wired for mast lamp,” but as experience has shown that the leads in torpedoes are particularly liable to deterioration and damage, they should be attended to and renewed occasionally. 22. A torpedo in Class (I.) will naturally be usually in running condition and “wired for lamp.” It will on no account be transferred to Class (II.) after its period of running, unless it is in good order. If there is any seriously unsatisfactory feature in its running, it will be retained in Class (I.) until the defect has been ascertained and remedied. 23. When a torpedo is transferred to Class (II.) (where it will lie idle for some time), the easily removable gear, such as the pistol, reciprocating pulleys, ring ejector gear, return pulleys, &c., will be taken out, examined, cleaned, lubricated, and replaced. The corrodible metal surfaces of these parts, and throughout the inside of the torpedo, will be lightly smeared with Vaseline, after the whole of the inside has been dried and cleaned as well as can be done without dismantling. 24. The sponges at the end of the inner shaft should be renewed. 25. Any slight defects or damage will be made good. Any points of importance, special adjustments, & c., noted during the period of running, will be entered in the torpedo history book, so that they may be to hand at once if the torpedo has to be run suddenly. 26. Torpedoes while in Class (II.) will be given attention occasionally to see that rust is not forming, & c. If necessary the gear must be taken out for examination, but if the overhaul has been well carried out on transference from Class (I.) to Class (II. ), and the parts well dried and smeared with Vaseline, as mentioned in 17, this should not often be requisite. 27. When a torpedo is taken from class (II.) into Class (I.) for practice, it should be run at first without any special overhaul or preparation other than the usual fitting up for a run of a torpedo already in Class (I.). This will be a test as to whether the torpedoes in Class (II.) are really ready for running at any moment. This applies to torpedoes lying in Class (II.) and brought into Class (I.) in ordinary routine. 28. A torpedo in Class (II.) which has been dismantled, or which has undergone material repairs or alteration, will be run at least once as soon as possible afterwards, and not be left in Class (II.) to take its ordinary turn in rotation, until it has run satisfactorily. When replaced permanently in Class (II.) it will be treated as described in (23). 29. Attention must be paid to keeping the parts clean, free from rust, and generally in good condition. Care must be taken with all watertight joints (see Part II.) so as to prevent, as far as possible, the entrance of water. When any part is known to have got wet it will be dried and cleaned. If these precautions are taken, and the above general directions followed, there is no reason why the gear should ever get into bad condition. 30. Torpedoes will be, as far as possible, protected from grit, sand, and dirt of all kinds. Grit has often been known to find its way into bearings from the actual waste or cloth used to clean the parts. Shafts standing out may accumulate grit and take it into the bearings. Wire drums standing in store, and not cleaned before being put into the torpedo, have caused damage to shaft bearings, owing to the shafts, when passed through the drum, picking up some of the dirt. There are, in fact, numberless ways in which grit and dirt may find an entrance, and too great attention cannot be paid to this point, especially in places where the air is liable to be laden with dust. 31. Great care must be exercised in all operations entailing lifting, lowering, and shifting torpedoes. Unnecessary damage may be caused by careless handling. 32. Torpedoes have been found to be scored on the under-body, and badly dented near the forward runners. It cannot be said exactly how this occurs, but it is probably die to irregularities in the levels of trolleys and rails, tipping cradle and slipway rails, & c. The denting may also be due to carelessly pushing the torpedo forward hard against stops. It must be seen that all rails are true to gauge and level, and care must always be taken in passing the torpedo from trolley tor ails, in tipping, and running the torpedo up to stops. 33. Should it ever become necessary for torpedoes to remain long unattended to, as, for instance, during work being done on installations, & c., hey should first be thoroughly overhauled, I possible. In any case they must b cleaned and dried and the internal steel surfaces coated with Vaseline. Boxes if quicklime should be placed in two or three places, and the entrance of air prevented by plugging all inlets. The door grooves should be packed with spurn yarn soaked in white lead (1 part) and Russian tallow (3 parts). The shell, after being cleaned, will be coated with the same mixture. 34. The various portions of the installation gear must be kept clean, free from dirt and grit, and well lubricated, as the torpedo gear. All oil holes and ways must be kept clear, and special attention paid to parts which are in any way hidden. All pulleys must run free and true. If any work is done on the installation necessitating the shifting of any gear, every precaution must be taken that all is lined up perfectly truly when replaced. 35. Misunderstanding may arise owing to the different interpretation placed on the terms “Right” and “Left” when applied to installation gear. More especially is this so in the case of pulleys, & c., as the wired do not follow, at different installations, the same rule as regards the pulleys over which each wire passes. “Right” and “Left” will always be taken to mean the right and left hand respectively of a person facing the incoming wire, i.e., looking in the direction opposite to that in which the wire is moving. In the case of engine-room gear, this will refer to the wire between the last fairlead pulleys and the reciprocating pulleys on the steering girder. In the case of the gear in torpedo store, slipway, passages, & c., it will refer to the general direction of the wire as it enters any of these. Horizontal pulleys will be referred to, if necessary, as “Upper” and “Lower”. In the case of torpedoes there can be no mistake. “Right “ and “Left”, as applied to all torpedo gear, means the right and left when standing at the stern and looking towards the bow. 36. Spare parts, both of torpedoes and installation gear, must be well looked after. Not being in use they are particularly liable to rust, & c. Vaseline will be freely used, painted parts scraped and repainted when necessary, and the gear generally kept in thoroughly good condition. II. – Maintenance and General. 7. An installation must be maintained in a complete state of preparation for action at any time, as soon as steam has been raised. Any matters which militate against this will be dealt with under paragraph 24, Regulations concerning Brenna Torpedo Installations, issued with Army Orders. 8. On receipt of a new torpedo, or of any gear which requires fitting or is of such a nature as to render trial desirable, such trial or fitting will take place as soon as possible after receipt. The Station Torpedo Officer must satisfy himself that the gear is serviceable. 9. Each torpedo should be completed with all its parts. All service parts which are not used in practice, except cells, will be fitted to the torpedo to which they belong, even though they may be nominally interchangeable. All such parts will be marked with the number of the torpedo, but this marking need not be of a permanent nature. In the case of torpedo drums, the opportunity should be taken, when service wires are replaced, to refit the drums before they are re-wound. 10. As far as possible every torpedo must be in good and reliable running condition at any time, except when actually undergoing overhaul or repair. The efficiency of torpedoes can only be maintained and relied on by regular running. The best method is to take two or three torpedoes into use at a time, running through the lots in rotation at least twice a year. 11. Each torpedo should be completely dismantled, and internally scraped and painted annually. The steel will be thoroughly cleaned and all rust removed. Bath brick and oil may be used for the shell when the torpedo is dismantled, but under no other circumstances. Even so, the greatest care must be taken that no traces of grit remain inside or out, on joint flanges, door flanges, or any other parts. 12. While a torpedo is dismantled, all parts, especially those which at other times cannot be easily got at, will be thoroughly cleaned and overhauled. When a torpedo has had much water in it, it should be dismantled as soon as possible afterwards. 13. Care must be taken that none of the torpedo gear gets interchanged with that of other torpedoes or spare gear, and that after dismantling, the whole, with the ballast, is replaced precisely as before. After dismantling and refitting, or any alteration of permanent ballast, &c., a torpedo will be put in the water and tested for buoyancy and trim (see “Ballast,” Part II.). 14. When putting together again all the steel surfaces in the torpedo will be lightly rubbed over with Vaseline. All bearing which do not get regular lubrication under ordinary circumstances, e.g., chain pully spindles, rudder bearings, runner axles, depth rudder rod connections, &c., will also be smeared with Vaseline. Such bearings will always be so treated when the parts are removed, and such as can be got at without dismantling the torpedo, will be occasionally removed for the purpose. 15. As stated under (11) bath brick will only be used when the torpedo is dismantled. No such gritty substance will be used ordinarily, nor should there be necessity for its use if due attention is paid. It is comparatively easy to prevent rust forming, but very difficult to remove it without great labour, or the use of objectionable substances. 16. After every day’s running the torpedo will be dried and rubbed over with olive oil. It is advantageous to wash the torpedo down with fresh water first to remove the salt, and this should always be done if the torpedo is to remain any time without being run, and before the mixture mentioned in (17), if used, is applied. 17. A simple and effective anti-rust composition for iron or steel parts, which It is desired to keep fairly bright, is given below. It may be found useful for the shells of torpedoes in store, and possibly other parts which require ti be kept free from rust and yet reasonably bright. Dissolve ½ oz. camphor in 1 lb. lard, take off the scum, and add sufficient black lead to bring the whole to a rather dark grey colour; mix well, and allow to cool. The mixture should be well rubbed and smeared over the metal surface when the latter is quite dry and clean, and left on for 24 hours. It should then, on surfaces it is desired to keep bright, be rubbed off with a linen cloth, more or less completely, according to the degree of brightness desired. How often renewal of the treatment is required will, of course, depend on the amount left on, and on local conditions or atmosphere, &c.
18. “Globe Polish” may be used on outside gunmetal surfaces which it is desired to keep bright. It should be well rubbed off again. Class (I.) Torpedoes which at any given time are in use in practice. Class (II.) Torpedoes which are in store and not in use at the time. 20. All torpedoes in Class (II.) will be, as far as possible, kept in such a state as to be ready for running at any moment, if necessary, without any further treatment than the ordinary preparation for running. As few as possible should be dismantled or under repair at any one time. It would be a lot of reading before you can actually do anything! I posted these to show how protective they were over their new secret weapon. You can imagine reading this on being posted to the unit. I. Special Regulations for the Preservation of secrecy. “(a.) The General Officer Commanding will be responsible that proper precautions are taken for guarding the installation. “(b.) All Officers, non-commissioned officers and men employed in torpedo installations shall make and sign a declaration of secrecy, on the usual form, before the Commanding Royal Engineer. “(c.) Civilian workmen, before being allowed to enter torpedo installations, must make and sign a declaration of secrecy on the usual form. If found inconvenient for this declaration to be made before the Commanding Royal Engineer, it may be made before the Division Officer, Submarine Mining. Civilians are not to be allowed to acquire any information respecting the installation or torpedo beyond what is necessary for them to see in connection with their duties. “(d.) The declarations will be guarded in the head-quarter officers of the district. “(e.) A record of the declaration made by a Warrant Officer, non-commissioned officer or sapper will be made on the back of Army Form B 195 (which forms part of his regimental documents) and in his pocket ledger. The fact of the declaration having been made will be reported in the Monthly Casualty Returns (Army Form B 76) furnished by Officers commanding units to the Assistant Superintendent, Royal Engineer Records. “(f.) In addition, an order shall be issued at each station drawing attention to the Officials Secrets act, 1889, and forbidding all persons employed in connection with this weapon to disclose to authorized persons any particulars they may have gleaned in connection with the weapon itself, the gear, or the installation. “(g.) Requisitions, vouchers and ordinary correspondence need not be forwarded confidentially, but correspondence containing matters in any way relating to details of gear or machinery, or to the state of the installations, as well as reports, plans, drawings, &c., should be strictly so dealt with. “(h.) All secret and confidential documents relating to the torpedo installation, of the nature of instructions, should be in the charge of the Station Torpedo Officer, who will be responsible for their safe custody. “(i.) The Station Torpedo Officer will maintain a complete set of any regulations and instructions concerning the installation and torpedoes. I. – The depth mechanism. II. – The steering mechanism. 3. These mechanisms are in metal cases, sealed up, and in no case is the seal to be broken. It will be part of the responsibility of the Station Torpedo Officer to make sure that the seals of the cases containing these mechanisms remain unbroken, making frequent inspection, and recording date and result in a book kept for that purpose. 4. The depth mechanism is not to be kept in the torpedo. It is made detachable, and is to be kept in a secure safe, fitted with two different keys, one to be held by the Station Torpedo Officer, and one by the local storekeeper or military mechanist, or, in his absence, the person acting for him, so that the chest or safe can only be opened in the presence of both Officer and storekeeper, or military mechanist. A duplicate set of keys will be kept by the General Officer Commanding or his Staff Officer of Royal Engineers. The depth mechanism should always be returned to the safe immediately after use. 5. The Station Torpedo Officer may temporarily hand over his key to such Officer as may be authorized by the Commanding Royal Engineer to act for him when he is unable to be present personally, and to such Officer only. 6. Should the Station Torpedo Officer quit the station, he is to formally hand over his key and charge to the Commanding royal Engineer, or to the Station Torpedo Officer duly appointed to replace him, or, if such Officer has not been appointed, to an Officer named by the Commanding Royal Engineer. This Officer should be one of those trained in Brennan Torpedo work, if available. A book recording all such transfers must be kept, and the entry of each transfer signed by the Officers effecting it. This was fully discussed in Committee of Supply, 10th March 1887, and agreed to, after a division, by 192 to 77. If he shall, during one year from 18th January 1887, commit such breach, and the parties to this bond shall pay the Queen 10,000l. as damages. If he shall, during one year from 18th January 1888, commit such breach, and 8,000l. be paid as above. If he shall, during one year from 18th January 1889, commit such breach, and 6,000l. be paid. If he shall, during one year from 18th January 1890, commit such breach, and 4,000l. be paid. If he shall, during one year from 18th January 1891, commit such breach, and 2,000l. be paid. It was arranged on 17th January 1887 (Minute by President, Royal Engineer Committee), that pending information as to the official decision on future arrangements, the secret parts had been taken out of the complete torpedo, separated, and part safely stored at Sheerness and part at Chatham, such parts being in charge of Messrs. Brennan and Temperley. While the negotiations above referred to were in progress, viz:- on 16th December 1886, the Agent-General for the Colony of Victoria wrote, stating that the Minister of Defence at Melbourne had requested him to obtain a full report of the capabilities and powers of the Brennan Torpedo, and asked at what price his Government could be supplied. He remarked that the Government of Victoria bore the charge of the first experiments with this torpedo, and have since watched, with natural interest, the reports of the trials to which it has been subjected; and he requested that directions might be given that he should be furnished with the information required. Director of Artillery, 20th December 1886, observed to Inspector-General of Fortifications, that at that time the department was not, in his opinion, in a position to give a definite reply, moreover, he was not aware that the Victorian Government had advanced any moneys towards preliminary experiments; and there was no mention of such advances in the official papers. Inspector-General of Fortifications, 24th December 1886, agreed. He had never heard before of the assistance referred to. The Surveyor-General of Ordnance saw that Agent-General (Sir Graham Berry) on 4th January 1887, and told him that negotiations with Brennan were not concluded, and that in the event of the torpedo being purchased, his letter should, after reference to the Secretary of State, be replied to officially. On 27th January 1887, the Surveyor-General again referred to the Inspector-General of Fortifications, 12th February 1887, thought it would be advisable to communicate in confidence to the Victorian Government the general results of the trials recently concluded, which he detailed. He remarked that is would scarcely be possible to name an accurate price for manufacture at the present time. The approximate estimate for each installation of 12 torpedoes, including engine buildings, &c., is 6,800l. but this is only a rough approximation, the torpedo itself being priced at about 300l. He added, although the Colonies might in process of time be supplied with the torpedo, &c., it would not be advisable to supply the weapon until experience has shown what practical precautions may be necessary for the protection of the secret. The Surveyor-General, 14th February 1887, in submitting to the Secretary of State, said the question was, whether the department could afford to run the risk of the secret (for which 110,000l. was being paid) getting out through the possible carelessness of a colonial official. He remarked that if the Victorian Government were prepared to share the responsibility, that is, to recoup the 110,000l. or a satisfactory part thereof, if the secret were let out through any laches in Victoria, he would not object to their admission into the secret; but that, failing that he thought no more should be done than to write such a letter as Inspector-General had proposed, adding that the secret of the mechanism of the torpedo having been purchased at a high price by Her Majesty’s Government, they did not feel themselves to be in a position to risk the possibility of the secret becoming public property. With reference to your letter dated 16th December 1886, requesting, by desire of the Government of Victoria, to be furnished with particulars of the capabilities and powers of the Brennan Torpedo, and with the price at which that Government could be supplied; I am directed by the Secretary of state for War to acquaint you, for the information of the Government of Victoria, that until experience has shown what precautions may be necessary for the protection of the secret, he cannot undertake to supply the torpedo. I am to add, however, that the general results of the trials recently concluded to show that the torpedo attains a speed of 22 knots an hour for short ranges, of 19 knots for ranges of 1,000 yards, and of 17 knots for ranges of 1,600 yards. It is well under control of the steering apparatus, and it maintains a constant depth. The weight of the charge is 200lb. of compressed guncotton. II. Articles of Agreement made 18th January 1887 between Her Majesty’s Principal Secretary of State, War Department, of the one part, and George Argent of the other part. 1. G. Argent shall be employed in the War Department as foreman in the manufacture, &c., of the Brennan Fish Torpedo up to 31st March 1892, and thenceforth from month to month, as the Secretary of state shall think fit, and he shall agree. 2. He shall receive, whilst so employed, the salary hereinafter mentioned payable quarterly. 3. Salary to be at the rate of 300l. per annum up to 31st March 1888, and thenceforth increase at 25l. per annum, but not to exceed 400l. per annum, not to cover travelling expenses. 4. G. Argent, while employed, shall go to and reside in such places in the United Kingdom as may be decided by the secretary of State, and shall obey orders of Secretary of State, or Officer placed over him. 5. He shall not, whilst employed, without the consent of the secretary of State, engage in any other business. 6. He shall at all times keep secret the construction of the invention, and all modifications, &c., save such matters as appear from published specifications of Letters Patent, dated 4th September 1877, granted to H. J. Haddon. And he shall not at any time, without consent in writing of the Secretary of state, give any information whatever with respect to the invention, or any modifications, &c., therein to any person. 7. If at any time, whilst employed, he shall neglect or refuse to serve the War Department, or shall commit any breach of clause 6, then the Secretary of State shall be at liberty to dismiss him. The complete agreements and bond, dated 18th January 1887, were duly executed, and letters of appointment were written to Messrs. Brennan and Temperley respectively, on 26th January 1887. I. Articles of Agreement made 18th January 1887, between Louis Brennan, and John Nesbit Malleson, agents for the Brennan Torpedo Company, Limited, of the first part, Louis Brennan on his own behalf, of the second part, John Ridley Temperley of the third part, William Calvert of the fourth part, and Her Majesty’s Principal Secretary of State, War Department, of the fifth part. 1. The Secretary of state shall, upon terms hereinafter mentioned, purchase the invention and exclusive use of the Brennan Fish Torpedo, and of all improvements, inventions, patent rights and secrets relating thereto. 2. Full information of secrets shall be given to the Secretary of State, or to such persons as he shall appoint; persons receiving such information not to divulge it without consent in writing of Secretary of State, such consent not to be given in the event of the 18th clause coming into operation. 3. The purchase shall include Patent of 4th September 1877, mentioned in the agreement of 1883, and all other the premises assigned or to be assigned by the indenture mentioned therein of 17th December 1880, and also the benefit of all the covenants contained in the said indenture on the part of L. Brennan, W. Calvert, C.G. Miller, and J.R. Temperley. 4. The purchase shall include all modifications, alterations, and improvements of the invention, which may hereafter be invented by or suggest themselves to L. Brennan and J.R. Temperley, and their exclusive use. 5. The improved Brennan Fish Torpedo already constructed, with all its mechanism and appurtenances, shall be included in the purchase. 6. The Company, and L. Brennan, J.R. Temperley, and W. Calvert, shall at all times, at the request and cost of the Secretary of state, execute all such assignments, &c., as he shall require for vesting in him anything comprised in the purchase, and that without any lien on unpaid purchase-money. 7. The purchase-money to be paid shall be 110,000l. payable by instalments and shall belong to and be paid to the Company, whose receipt shall be a sufficient discharge. 8. An instalment of 30,000l. shall be paid before the expiration of three calendar months from date. The remainder of the purchase-money to be paid by five annual instalments of 16,000l. each, the first to be paid on 31st March 1888, and another on each succeeding 31st March until the whole be paid, but without interest in the meantime, each to be without deduction for Income Tax, and to be considered to accrue from day to day and be apportioned accordingly. 9. L. Brenna and J.R. Temperley, shall be employed by the War Department up to 31st March 1892, in the manufacture and improvement of the Brennan Fish Torpedo, L. Brennan as Superintendent, and J.R. Temperley as Assistant Superintendent; the employment to be determinable as hereinafter mentioned. Each of them to give his whole time, energy, and attention to the work, and to give the Secretary of State full information of all improvements. 10. L. Brenna, whilst employed, shall receive 1,500l. per annum, and J.R. Temperley 1,200l. per annum. Salaries to be paid quarterly. Neither of them to have any claim to pension. 11. Each of them to reside, whilst employed, within 20 miles of the principal Government manufactory of the torpedoes; to go to such places as may be directed by the Secretary of State, or officers empowered by him. Salary should cover lodging and other allowances, save usual allowances for travelling. 12. Each of them. Whilst employed, shall give his whole time, energy, and attention to the purposes for which he shall be employed, and neither of them shall, without consent of the Secretary of state, engage in any other business. 13. Each of them will, whilst employed at any time, at the request and cost of the Secretary of State, take out any patents for the invention or improvements by them, and assign them to the Secretary of State. 14. The company, L. Brennan, J.R. Temperley, and W. Calvert will keep secret the construction of the invention, and of all modifications, improvement, &c., save such matters as appear from the published specification of the hereinbefore mentioned Letters Patent, and neither the Company nor either of the persons named above, nor any person by their direction or consent will, without the consent in writing, of the Secretary of State, give any information with respect to the invention, modifications, &c., to any other of them, or to any other persons other than the persons appointed by the Secretary of State, in pursuance of Clause 2. 15. If at any time before the payment of the whole of the purchase-money there shall be any breach of Clause 14, then every instalment remaining to be paid shall cease to be payable, and that without prejudice to any right of action by the Secretary of State, provided that there shall be paid so much of such instalment as shall have accrued due between 31st March immediately preceding such breach and the date of such breach. 16. If, whilst either L. Brennan and J.R. Temperley are employed, he shall neglect or refuse faithfully to serve the War Department, the Secretary of State shall be at liberty to dismiss him; and every instalment, if any, then remaining to be paid of the purchase-money, shall thereupon cease to be payable. Provided as in 15 with regard to any amount accrued since the preceding 31st March. 17. If at any time whilst L. Brennan and J.R. Temperley shall be employed, the Secretary of State shall determine to abandon the manufacture of the invention, then the Secretary of State shall be at liberty to dismiss them. 18. If at any time before payment of the whole of the purchase-money the Secretary of State shall determine to abandon the manufacture, then all the instalments remaining to be paid shall cease to be payable, and the premises comprised in the purchase-money shall revert to the Company; but all torpedoes, mechanism, &c., previously manufactures for the Secretary of State, shall remain his property. 19. The Secretary of State shall procure duplicates of the agreement to be stamped at request of Company. 2. Draft Agreement for the employment of Mr. Argent in the service of the War department, in the manufacture of Brennan fish torpedo. No question arose on this. 3. Draft Crown Bond by Messrs. Brennan and Temperley, and defeasance thereto, providing for Messrs. Brennan and Temperley to be bound in 20,000l. ; conditionally on Argent’s breach of secrecy. Messrs. Brennan and Temperley did not quite understand why 20,000l. was named in the bond; but this point (believed to be a purely legal formality) would, it was thought, no doubt be explained if necessary. They also mentioned that they had understood that the Company, and not themselves individually, were to give the bond. This was not at all understood by the War Office representatives; and no mention of the Company had been made in previous interviews. It was mentioned to Messrs. Brennan and Temperley that, probably, the Company would indemnify them; at the same time, if the Treasury Solicitor was satisfied to take the Company’s Bond instead of theirs, the War Office would make no objection. The record was sent to Treasury Solicitor, 12th January 1887. He notified, 13th January 1887, that necessary alterations had been made in the drafts, and that a new Clause (13) had been inserted, providing that Messrs. Brennan and Temperley should at any time, if called upon, take out patents abroad or at home, for any improvements, and assign the same to the Secretary of State. A twelfth interview was held on 15th January 1887. Draft agreements, as altered by the other side, were discussed, and points as to contract (Clauses 2 and 14) and stamping of agreement (Clause 19) were settled. Messrs. Brennan and Temperley had altered clauses as to reserving the first payment of 30,000l. from the effect of any wilful breach, and as to not engaging in any other business “that would interfere with their employment under the agreement.” They, however, agreed to waive these alterations. Clauses 15 and 16 were amended, so as to provide for payment pro rata up to date of disclosure or discontinuance, of instalment of 16,000l. then accruing. This was agreed to. A point was made as to argent’s increments of salary being such (25l. instead of 10l. a-year) as would bring him to the maximum of 400l. for the fifth year. The papers were returned to Treasury Solicitor for preparation of final documents. Referring to previous correspondence and to the inter-departmental communications that have passed in regard to purchase of the Brennan Torpedo. I am directed by the Secretary of State for War to request that you will move the Lords Commissioners of Her Majesty’s Treasury to signify their sanction to the general terms that have been agreed upon as embodied in the deeds, which have been settled by the Treasury Solicitor. 1. Payments of 110,000l. (without deduction for Income Tax) spread over five years, and six instalments; the first instalment of 30,000l. being payable this year, and the remaining five instalments at the rate of 16,000l. a-year. 2. The employment of Messrs. Brennan and Temperley at consolidated salaries of 1,500l. and 1,200l. a-year, including all allowances, to date from 18th January 1887, and continue under certain conditions to the 31st March 1892. 3. The employment of Mr. Argent as foreman from the same date, and for the same period, at 300l. a-year, rising by 25l. a-year to a maximum of 400l. The Lords Commissioners of Her Majesty’s Treasury have had before them your letter of the 15th instant, requesting their formal sanction to the terms which have been already made, with the semi-official concurrence of this department, for the purchase of the Brennan Torpedo. 1. The payment of 110,000l. (without deduction for Income Tax) spread over five years, and six instalments; the first instalment of 30,000l. being payable this year, and the remaining five instalments at the rate of 16,000l. a-year. Their Lordships have consented to these terms, the liberality of which exceeds all precedent, in the hope that the acquisition of the torpedo will prove them and of greatly reducing expenditure in defending, more especially mercantile ports at home, and the smaller coaling stations abroad. The papers having been submitted to Mr. Smith, he, in a note addressed to Mr. Northcote, dated 5th January 1887, agreed with Mr. Jackson that all who were acquainted with the secret must join in the contract and obligation. He said the bond for 10,000l. would not do; and that Messrs. Brennan and Temperley must be told that some how they must bring argent into the contract to the satisfaction of the Solicitor. He quite agreed to the omission of the words italicized in his minute of 26th December 1886. An eighth interview was held with Messrs. Brennan and Temperley on 5th January 1887. He Surveyor-General explained that the Treasury held to the view previously taken as to the contract, which should be signed by all who possessed the secret; and that the Secretary of State endorsed this view. He read that portion of Mr. Smith’s note above-mentioned which referred to this point. A discussion ensued, in which Messrs. Brennan and Temperley stated that the matter presented great difficulties; that it in effect resolved itself into their being responsibility for Argent, and that they thought the bargain had been concluded. The Surveyor-General pointed out that all had depended on Treasury approval. Another interview (the ninth) was held later on the same day (5th January 1887). Mr. Northcote said he had been to the Treasury and explained what had been urged by Messrs. Brennan and Temperley. He asked if they would object to Argent entering into a separate bond, or solemn agreement. They thought it would be a natural thing to do; their bond would of course be in addition. It was explained that even if Argent left it would be a long time before such knowledge as he possessed could be turned to practical account. It was suggested that in case Messrs. Brennan and Temperley were going to award Argent any sum, they might consider the propriety of spreading it, as an additional hold upon him. They accepted this suggestion; and sated, moreover, that Argent and all the men associated with them had signed declarations to them to preserve secrecy. On the whole there seemed no difficulty in securing Mr. Argent, so far as such a bond or agreement was concerned, and they agreed to have a draft prepared. A tenth interview was held on 6th January 1887. Mr. Temperley said a draft had been drawn up for Mr. Argent. It contained more than they thought necessary, but that would be for consideration with Treasury Solicitor. Mr. Northcote read a letter he was writing to the Treasury, with Mr. Smith’s consent. Mr. Temperley said Mr. Argent had about 500l. of his own, and was willing to enter into a bond for all he possessed. They proposed to give him a bonus of 100l. on 1st April 1887, and 400l. more at the end of five years; and there would be an undertaking that he should immediately notify any letters received or any attempt to obtain from him secret information. Mr. Northcote, on the same day (6th January 1887), wrote a letter – above referred to – to Mr. Jackson, stating what had passed at the interview of 5th January, and that the Secretary of State had authorized him to settle the matter, subject to the approval of Mr. Jackson and Sir A. Stephenson. Mr. Jackson replied, 7th January 1887. He thought the basis of an agreement could be found, and that Argent could be made a party to the agreement sufficiently to give reasonable security for his secrecy. He promised to send in writing the heads of an agreement, which he and sir. A. Stephenson would suggest, and which would probably be acceptable to Messrs. Brennan and Temperley. Draft agreements were accordingly prepared, and were handed by Mr. Jackson to Mr. Engelback at the Treasury, on the evening of the 11th January 1887, and an eleventh interview was immediately held at which the drafts were read and discussed. 1. Draft Agreement with the Brennan Torpedo Company (Limited), and others for the purchase of the invention of the Brennan Fish Torpedo, and for the employment of Messrs. Brennan and Temperley in the service of the War Department. First payment. – Period of six months for, rather demurred to. War Office thought three might be substituted. This had been practically conceded in previous interviews. Messrs. Brennan and Temperley, or either of them, being required to proceed out of the United Kingdom. Mr. Brennan raised no objection. Mr. Temperley rather demurred. War Office must retain full discretion. As to discontinuance of manufacture involving also abandonment of the use of the torpedoes then in possession. It was explained that such a point could not be conceded. (a.) As to the greater convenience in some respects of separate agreements for the employment of Messrs. Brennan and Temperley. This, so far as the War Office was concerned, was not deemed material. (b.) As to confirmation of the agreement by a deed under the Company’s seal. Messrs. Brennan and Temperley said there would be no difficulty in obtaining this, it being understood that the negotiations would not be delayed for it. (c.) As to special power of attorney from the Company for each instalment. Another point was mentioned, as had been desired in conversation by Mr Jackson – viz., as to existing patents and the desirability of calling upon Messrs. Brennan and Temperley to take out patents abroad for the greater security of the Government rights and their hold over Messrs. Brennan and Temperley. It appeared that the only patent existing is the British patent of 4th September 1877. There are none abroad; and, as a matter of fact, such patents are not respected by Foreign Governments. War Office agreed with Messrs. Brennan and Temperley that it was not desirable to move in this matter.